Here are some snazzy birthday facts about 12th of September 1942 that no one tells you about. Don’t wait a minute longer and jump in using the content links below. Average read time of 10 minutes. Enjoy! What day was my birthday Sep 12, 1942? September 12, 1942 was a Saturday and it was the 255th day of the year 1942. It was the 37th Saturday of that year. The next time you can reuse your old 1942 calendar will be in 2026. Both calendars will be exactly the same! This is assuming you are not interested in the dates for Easter and other irregular holidays that are based on a lunisolar calendar. There are 143 days left before your next birthday. You will be 77 years old when that day comes. There have been 27,981 days from the day you were born up to today. If you’ve been sleeping 8 hours daily since birth, then you have slept a total of 9,327 days or 25.54 years. You spent 33% of your life sleeping. Since night and day always follow each other, there were precisely 948 full moons after you were born up to this day. How many of them did you see? The next full moon that you can see will be on May 18 at 21:13:00 GMT – Saturday. Fun stat: Your first one billion seconds (1,000,000,000) happened sometime on May 21, 1974. If a dog named Esme - a Australian Terrier breed, was born on the same date as you then it will be 324 dog years old today. A dog’s first human year is equal to 15 dog years. Dogs age differently depending on breed and size. When you reach the age of 6 Esme will be 40 dog years old. From that point forward a small-sized dog like Esme will age 4 dog years for every human year. Adolf Hitler joins the German Workers’ Party (later the Nazi Party). An explosion at the Hercules Powder Company plant in Kenvil, New Jersey kills 51 people and injures over 200. U.S. Senator and future President John Fitzgerald Kennedy marries Jacqueline Lee Bouvier at St. Mary’s Church in Newport, Rhode Island. Premiere of Bonanza, the first regularly scheduled TV program presented in color. What does my birthday September 12, 1942 mean? Your birthday numbers 9, 12, and 1942 reveal that your Life Path number is 1. It represents initiative, potential and singularity. You are a born leader. You insist on your right to make up your own mind; you demand freedom of thought and action. The following celebrities also have the same life path number: Roy Rogers, Tony Burton, Renato Russo, Roddy Maude-Roxby, Ekin Cheng, Jerry Keller, Humphrey Bogart, Martin Deschamps, Lloyd Richards, David Clayton Rogers. 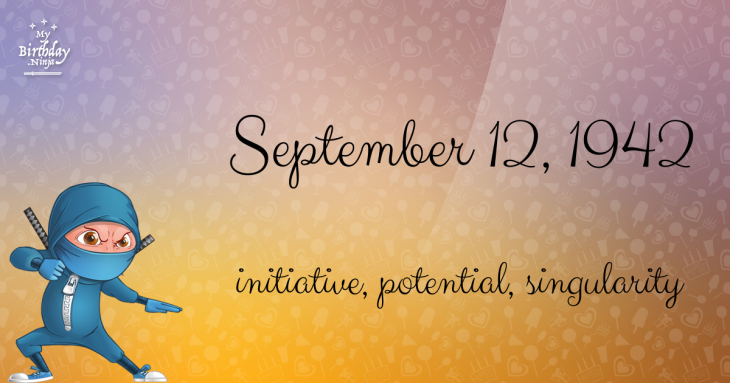 What is the birthday horoscope for Sep 12, 1942? The Western zodiac or sun sign of a person born on September 12 is Virgo ♍ (The Maiden) – a mutable sign with Earth as Western element. The ruling planet is Mercury – the planet of communication. According to the ancient art of Chinese astrology (or Eastern zodiac), Horse is the mythical animal and Water is the Eastern element of a person born on September 12, 1942. Fun fact: The birth flower for 12th September 1942 is Aster for memory. What is the Love Match for Sep 12, 1942? When it comes to love and relationship, you are most compatible with a person born on January 12, 1942. You have a Love Match compatibility score of +155. Imagine being in love with your soul mate. On the negative side, you are most incompatible with a person born on April 9, 1928. Your incompatibility score is -167. You’ll be like a cat and a dog on a love-hate relationship. Arf-arf, I want to bite you. Meow-meow, stay away from me! What is the popular baby name on 12 Sep 1942? Here’s a quick list of all the fun birthday facts about September 12, 1942. Celebrities, famous birthdays, historical events, and past life were excluded. 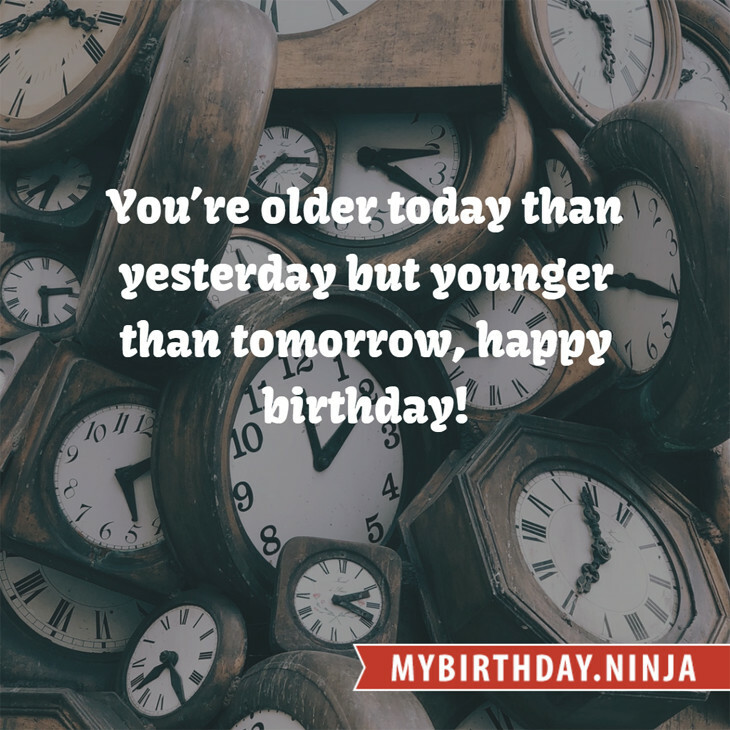 Try another birth date of someone you know or try the birthday of these celebrities: December 2, 1987 – Mari-Leen, Estonian singer; December 8, 1989 – Jen Ledger, English singer and drummer (Skillet); November 4, 1969 – Sean Combs, American rapper, producer, and actor (Diddy – Dirty Money).